Upon further investigation there is a reason “Conversation Piece” sounded so familiar that day. Turns out It was first released in 1970 as a b-side, and then later tacked onto the Space Oddity reissue, which I assume is how I originally heard it. 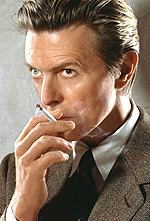 The version below, off Heathen, was apparently re-recorded in 2000 for an album Bowie has yet to release entitled Toy. I hope you enjoy this track as much as I have the past week. + Visit The Hype Machine for additional David Bowie MP3s. A marvelous updated version. An album of some of his older 60’s songs that he reworked entitled Toy was supposed to be released around 2001, but it’s been indefinitely shelved (more info + snippets at http://www.illustrated-db-discography.nl/Toy.htm). A rocked up version of You’ve Got A Habit of Leaving from those sessions was released as a B-side to the Slow Burn single (off Heathen) and is particularly good, as is the remake of Baby Loves That Way also included on the single. Amoeba is a bit out of my way, I’m gonna have to try Second Spin. I just put this album on my Ipod. Bowie intimidates me at times, because he’s always shifting styles. i picked up ‘heathen’ when it came out, as i was trying to get into bowie (at the time i only had ziggy). i occasionally spin it to this day, as i truly enjoy it. thanks for the bonus track. I think the Buddha Of Suburbia was his last good record. Thanks a lot for this! Great song. Have you heard the 1970 version of Prettiest Star which featured Marc Bolan on guitar?